Curious who is going to get the rookie cup on their 2015 Topps Baseball cards? The 2014 Topps All-Star Rookie Team has been announced. Leading the way is American League Rookie of the Year, Jose Abreu. He hit 36 homer and drove in 107 runs in his first year with the Chicago White Sox. Other standouts on the list include Kolten Wong, Billy Hamilton and Xander Bogaerts. What's notable is the omission of National League Rookie of the Year, Jacob deGrom. He was beat out by Masahiro Tanaka for the right-handed starting spot. The last ROY not to make the Topps Rookie All-Star Team was Andrew Bailey in 2009. 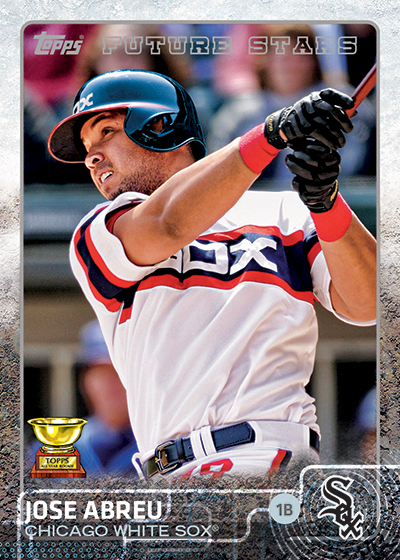 Collector will find base cards with the rookie cup when 2015 Topps Series 1 Baseball releases at the start of February.